Turn on that holiday music, take out that tinsel and pour yourself a cup of steaming Glühwein because it’s time to enter the festive world of European Christmas markets. From roughly mid-November to December 24th, hundreds of European city squares and old town streets become home to annual Christmas markets. The abundance of Christmas lights and glitter from hundreds of ornaments make these city streets and squares sparkle, and the rich aroma of mulled wine always gives the frosty air a good dose of warm and cozy. If you want to get into the Christmas spirit, visit a Christmas market…or simply stay tuned and immerse yourself in my upcoming posts, because from now up until Christmas, I will be publishing posts solely dedicated to European Christmas markets…and the cities that host them. Without further ado, to start off this Christmas market series, the first festive winter wonderland we’ll be exploring is Zurich, Switzerland. 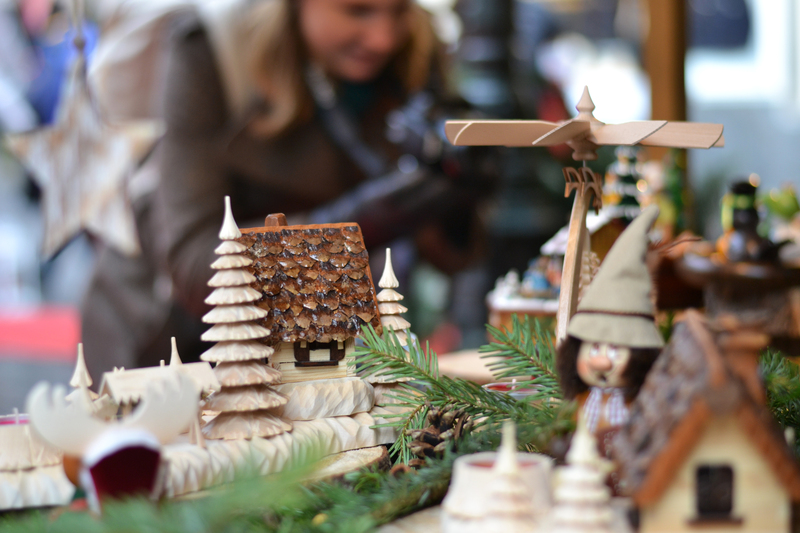 From the end of November until Chritsmas Eve, numerous Christmas markets fill the streets and squares of Zurich. During this time, no lampost or street corner is left unadorned. Wreaths, lights, and ribbons cover all available surfaces, and glühwein is never in short supply. Hundreds – if not thousands – of exquisite, shimmering ornaments hang on display ready to find new homes on visitors’ Christmas trees. 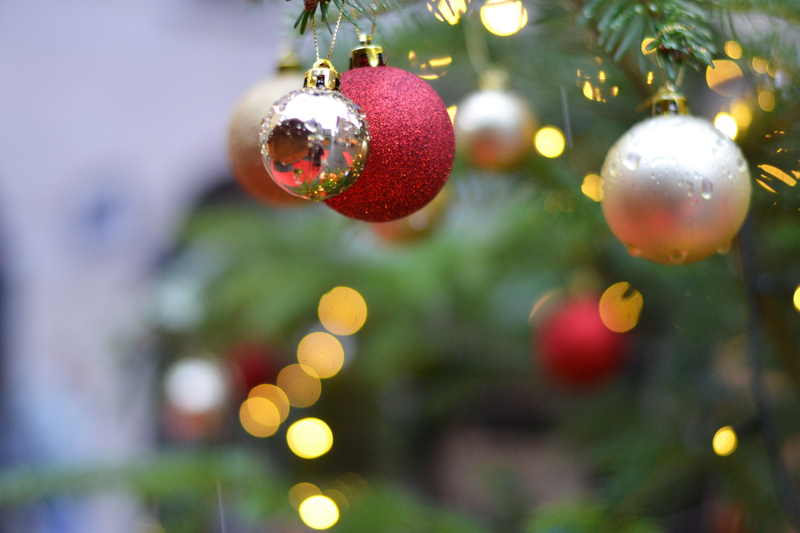 It’s impossible to believe that Christmas Day is still days to weeks away while walking through Zurich’s markets; the festive, holiday atmosphere is bound to convince you that Christmas is here today. 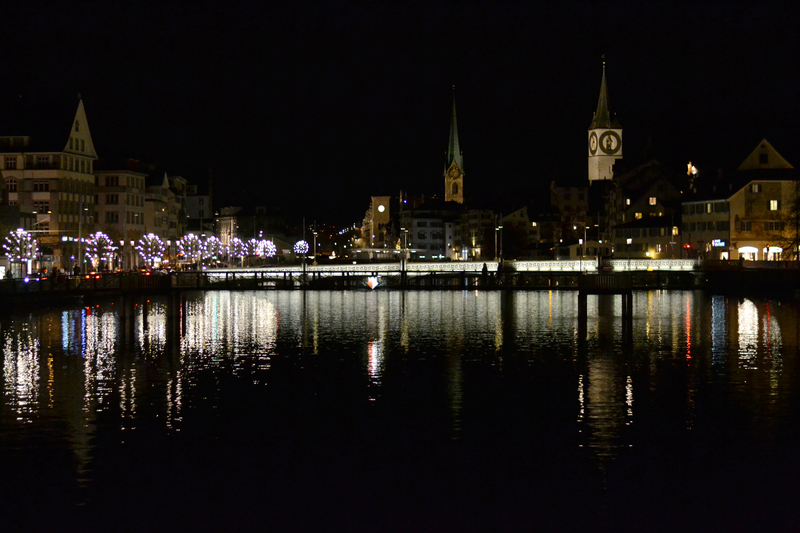 I visited Zurich as a quick weekend trip with two good friends at the end of November, 2015. The goal of this trip was to explore Christmas markets outside of Sweden, and simply bask in the holiday spirit. We visited 3 of Zurich’s main Christmas markets, and if you can’t tell from the description above, I loved every second in each of them. One of Zurich’s biggest Christmas markets – referred to as the Christmas Village –is located right by Lake Zurich and in front of the city’s remarkable opera house. Nearly 100 little, red wooden houses fill up the square during the holiday season and form a myriad of winding paths for market goers to explore. At this Christmas Market, you will also find a centrally-located, giant Christmas tree and a skating rink. The Opera House in the background. Scattered throughout the narrow streets in the city’s old town, you will find more wooden, cottage-like market stalls. 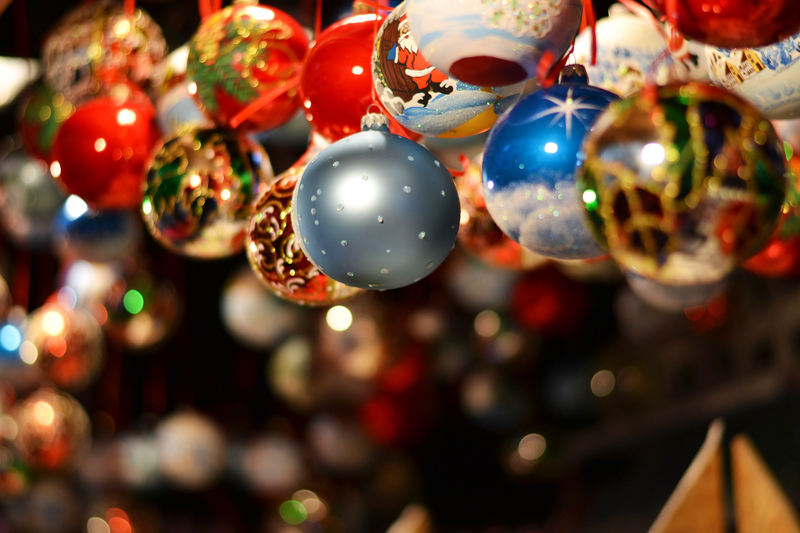 Lots of Christmas ornaments and holiday paraphernalia can be found in the Old Town Market. Personally, I loved the exceptionally festive and cozy atmosphere of this market. A Christmas market stall selling all I need to survive the winter season. 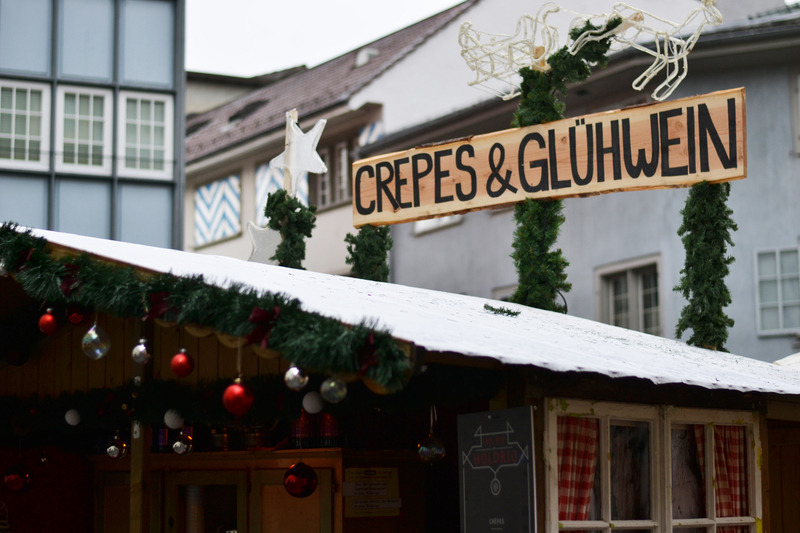 What better way is there to be welcomed to Zurich during the holiday season than with a Christmas market? If you visit Zurich in December (before Christmas), you will find a Christmas market on the top floor of the city’s central train station. At this market, you will find a diverse range of items to browse through and foods to try – traditional and not. It’s important to note that if you’re not a fan of cold weather, this may be the market to visit as it’s held inside. The towering Christmas tree decorated with Swarowski crystals in the centre of the market is something that shouldn’t be missed as well. A close-up of the Swarowski-decorated tree. For more detailed info about market locations and opening hours, check out Zurich Tourism’s page about the city’s Christmas markets by clicking here. Of course, Zurich has so much more to offer travellers during winter season than just Christmas Markets. 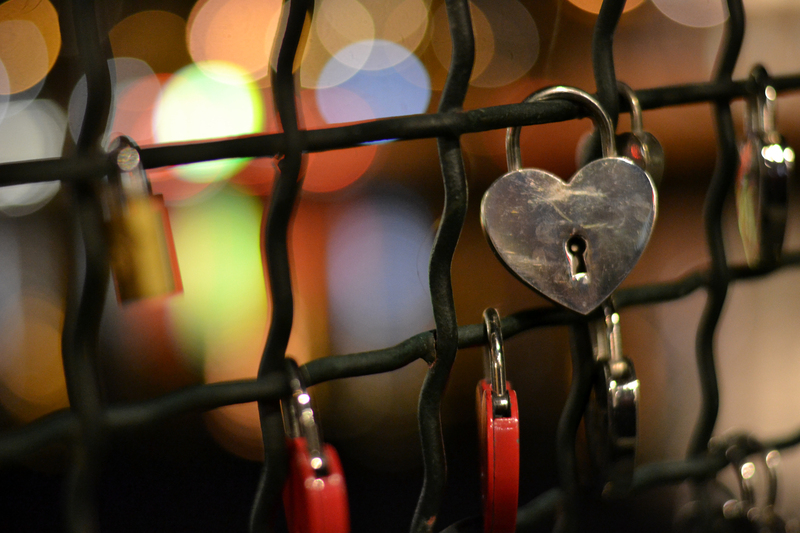 Even though we only had 36 hours in the city, we were determined spend time in the city’s different areas and visit attractions within and just outside of the city. Located in the old town, Lindenhof Hill gives visiters a panoramic view of the city on the east side of the Limmat River. 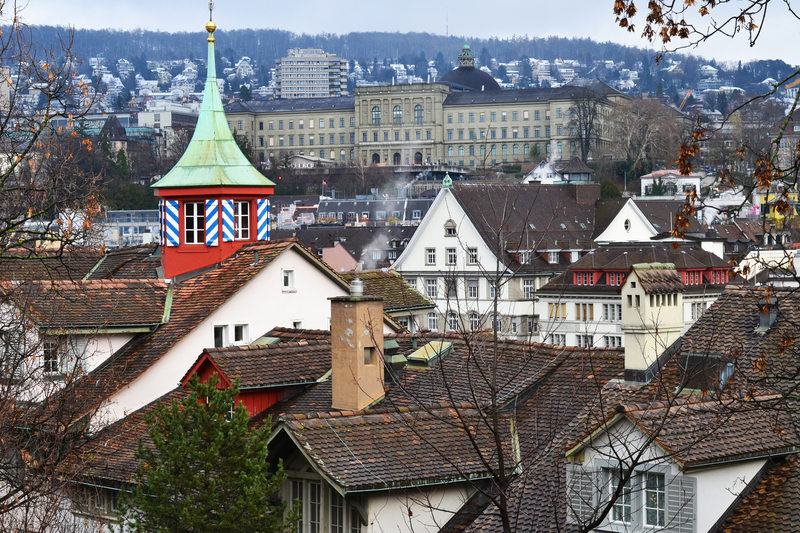 From the hill’s terrace, you can see the Grossmünster cathedral and the Old Town surrounding it. Lindenhof Hill is also a calm and open area in comparison to the bustling downtown streets around it. When admiring Zurich’s downtown skyline, this church is impossible to miss. Not only is St. Peter’s Church one of Zurich’s oldest churches, but it also has Europe’s largest clock face on its clock tower. While we didn’t have time to go inside this church, it’s on my “to-do” list for a future visit. Spending all day outdoors in order to explore the city during the holiday season may leave feeling rather chilly. Of course, glühwein is readily available to help combat the cold. Nevertheless, if you’re looking for something a little extra and a unique opportunity to see the city’s skyline, grab your bathing suit and go to Thermalbad & Spa Zürich. Built in a former brewery, the wellness centre gives patrons the opportunity to unwind and relax by using their steambaths and indoor and outdoor thermal baths. If my description of Thermalbad & Spa Zürich has captured your interest, check out their site for further information by clicking here. You can also find out more about the spa services they offer on their page. When I think of Switzerland, I think of mountains…and I’m completely obssessed with mountains. Even though we were spending less than two days in Zurich, I knew that I needed to get my mountain “fix” in some way, shape, or form. Fortunately, Zurich has its own mini-mountain just outside of the city and it’s called Uetliberg. The base of Uetliberg is just a quick 20 minute train ride from Zurich’s main train station. While you can’t manage a speedy, half-day trip to the Alps from Zurich, if you’re lucky, you can catch a glimpse of them in the horizon from the top of Uetliberg. Overall, from the top of this mountain, you are usually guaranteed to get a panoramic view of Zurich, Lake Zurich, and the surrounding hills. Scenery and views from the top of Uetliberg. 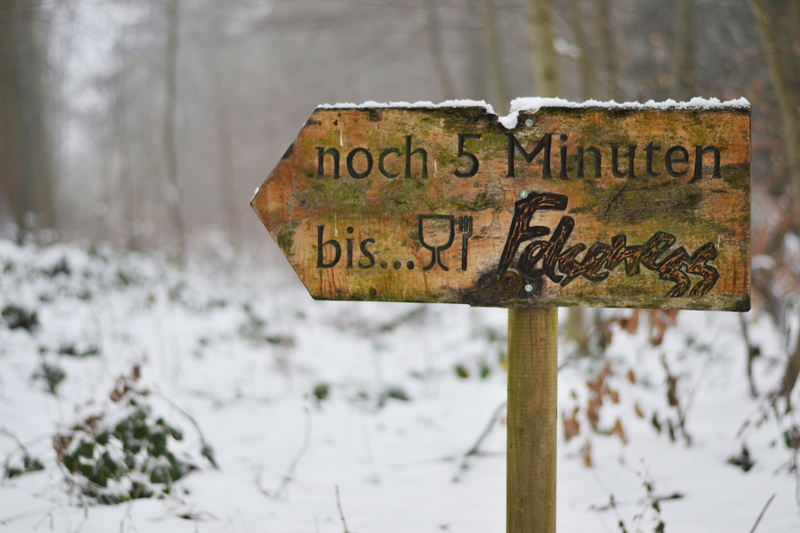 In order to reach the top of Uetliberg, you can choose to pay for a gondola ride or hike (and it’s really awesome to know that these hiking trails turn into sledding paths in the winter – how incredible is that?! Activity one million and one has been added to the bucket list). Since we were short on time, we opted for the gondola ride. Little did we know that our little gondola would be a portal to Narnia. Even though it had snowed quite heavily in Zurich that morning, the snow hadn’t stuck. However, when we arrived at the top of the “mountain” via gondola, we found ourselves in a winter wonderland. We also found our “inner children” and devoted a good amount of time to frolicking in the snow and initiating snowball fights. The unexpected snow was the icing on the cake for our Christmas Spirit Immersion Program. After some of our gloves had soaked through, we decided to walk along the forested trails at the top of Uetliberg and made our way to one of the chalets for lunch. There, we enjoyed much-needed cups of tea and sandwiches with local meats and cheeses. Our entire trip to Uetliberg took less than four hours, and we returned to the Zurich with many hours left for exploring the city. Visiting Uetliberg is a highly recomended and a more than manageable excusion. In all honesty and for the love of cheese, Swizerland has a special place in my heart. After setting foot in my first European Christmas market in November 2014, I instantly became obsessed. From that year on, I made it my mission to visit one Christmas market in a different country every holiday season (so far, so good). Zurich, Switzerland was my Christmas market destination of 2015 and the trip not only lived up to, but surpassed all of my hopes and expectations. If the Swedish SJ trains align (literally – because there was a minor derailment last week), my 2016 Christmas market expedition is coming up soon. I’ll be heading off to the motherland of Christmas Markets, so expect a full report on a German Weihnachtsmarkt…or two… to arrive soon. Thank you! I absolutely loved Zurich and will need to go back and definitely spend more than 36 hours in the city. Wow wow wow!! The pictures look so magical!